Sep. 21, 2017 1:43 p.m.
SURREY — A hockey program that uses sport to help at-risk Surrey youth has received a large boost. Fraser Grain Terminal and Fraser Surrey Docks announced a $150,000 donation to the Surrey HEROS Hockey program on Monday. It’s said the funding will give HEROS (Hockey Education Reach Out Society) enough money to pay for its Surrey operation for three years. An event Monday (Sept. 18) kicked off the season, and was attended by Harnarayan Singh from Hockey Night in Canada’s punjabi edition. The organization has been around since 2000. It began as a summer hockey program on the Downtown East Side for kids who couldn’t otherwise afford to play. 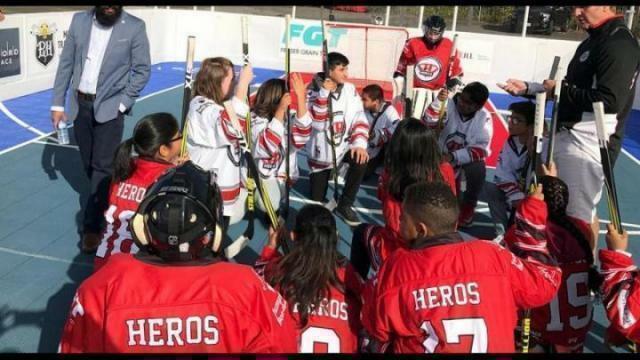 HEROS’ mission is to empower at-risk youth in grades 4 to 12 through ice hockey by instilling life skills, providing sport training, education and even scholarships. It has since evolved into a hockey-based mentorship program that’s in 22 cities across the country, helping 7,000 Canadian children a year. Last year, it first made the move to Surrey, helping 40 kids in a pilot project in partnership with the Surrey school district. With the new funding, they’ll continue to help that many kids per year. Hodgson said there was “constant” interest for the program to move to Surrey, and HEROS wanted to be there. The first year in Surrey went “extremely well,” he said. “It came out of the gate stronger than any of the programs we’ve had across Canada,” said Hodgson, adding he’s been pleased to see huge participation from families of the kids in the program. Hodgson said typically, 10 per cent of players in hockey are female, but within HEROS, that number is about 30 per cent. Another is recent Syrian immigrant El Hassan, also 12, who said HEROS helped him settle in Canada. The kids don’t just learn hockey, they also get to meet – and play with – NHL players. Vancouver Canuck Sven Baertschi is HEROS’ ambassador and has come out to play with the Surrey kids. Other NHLers supporting the program include Brenden Dillon (San Jose Sharks) and Jujhar Khaira (Edmonton Oilers), who were both born and raised in Surrey. In addition to ice time, kids will also be introduced to the two companies who donated to the program. “HEROS players will receive an ‘up close’ understanding of our facility and the many jobs our organization provides. This exposure may spark job interest and encourage career planning,” said Scott. Casey McCawley, HEROS co-founder and vice president of west coast operations for Parrish & Heimbecker, agreed. The event included a tour of Fraser Surrey Docks. To learn more about the program, visit onemillionskates.com/heroshockey/about.